Sawasdee Kap, welcome to Jumunjy Thai Street Food! 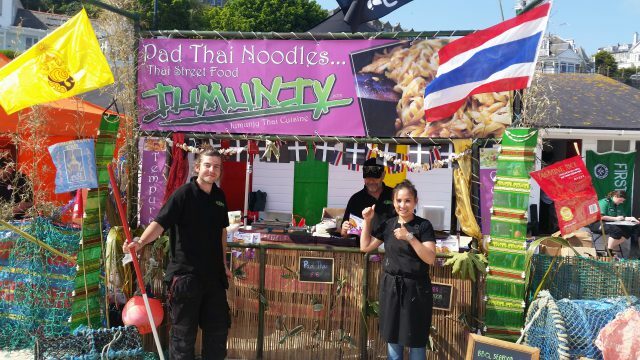 Authentic Thai Street Food at its best.. We pride ourselves on being the tastiest Thai your taste buds have tried.. We cook in the UK using the same Thai brands as we used in our Restaurant in Thailand for many years, and make no substitute! The taste and smell rocks it will take you back to Siam..
We display are dishes front of stall in “Big Pan Woks” creating food for your eyes with beautiful rich colours and aromas, you are always welcome to try our dishes and ask questions, we have dishes suitable for all the family and also have Vegetarian & Vegan options.. Our packaging is Bio degradable & Eco friendly..